Ever since being a child, summer for me is a season when I get a lot of sleep and boost my immune system with all the fruits and vegetables from my grandparents’ garden. Even though here in America I’m lucky to have access to organic produce all year long, I still feel the need to rejuvenate my body with the abundance of vitamins during the warm season so it’s easier for my body to make it through winter. Lately, I’ve been taking the same approach not only towards my eating habits but also in respect to skin care. In fact, the only skincare brand that I use while in the Hamptons is Frudia, a newly launched high-tech Korean skincare brand that is now available at CVS and FrudiaUSA.com. 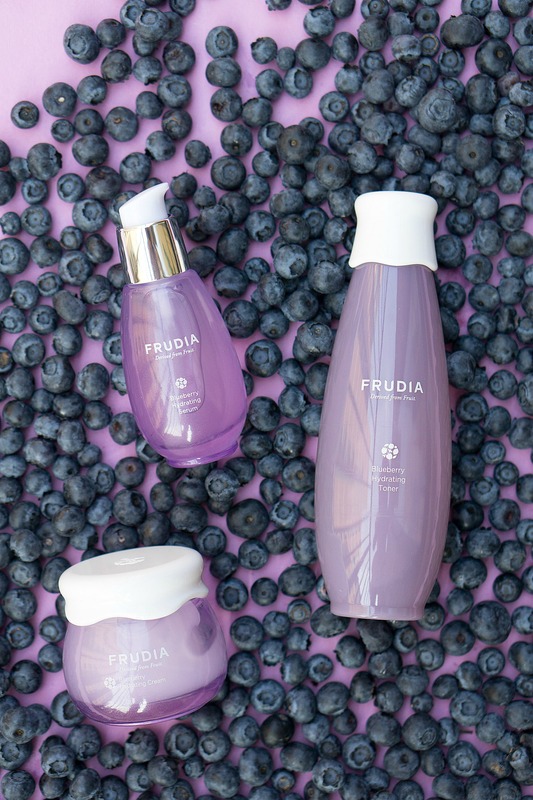 Each of four skincare lines by Frudia is created around one specific fruit. And each product from these lines is infused with the natural fruit concentrate derived from that fruit. That fruit extract is what makes Frudia so special. Check out the ingredient list for the majority of skincare products and the first thing you’ll see is water, which means that you are basically paying for the ingredient that doesn’t do much for your skin. While Frudia products list fruit-derived extracts that are full of antioxidants and vitamins for your skin. I’ve been testing Frudia products even before the brand has been officially launched in the US and I have lots of favorites and reviews to share. Saying so, I’m happy to announce the launch of the new series on my blog, called Frudia Vitamin Month where I will be talking about the benefits of fruits and berries for your skin and health and share reviews of my favorite Frudia products. 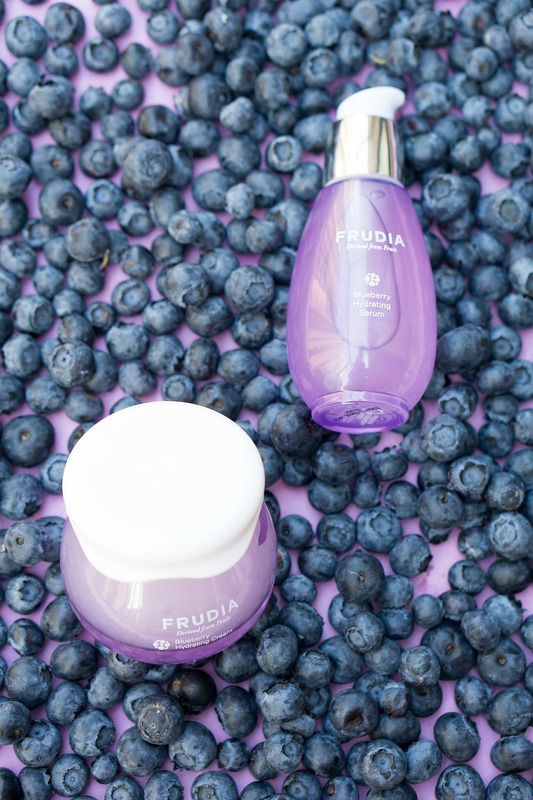 The first line I’d like to start with is Frudia’s Blueberry Line which is designed for skin lacking hydration. It features brand’s best-selling moisturizer and three more products that constitute a full skincare regimen that will help after-sun skin look nourished, properly hydrated and healthy-looking throughout the day. As probably many of you, for the longest time ever I was not using a toner as a part of my skincare routine. Usually, I would spritz my face with a thermal water and start applying my creams and serums. While I still continue using thermal water, I do use a toner too. I noticed that for my acne-prone skin it’s essential to replenish the skin after washing it with water and a gentle cleanser. A good toner not only delivers all the nourishing skin care ingredients into the skin but also helps to restore a PH balance of the skin that was stripped after washing with water. Be prepared though that the Blueberry Hydrating Toner by Frudia is nothing that you ever have seen before. It features a bit thicker consistency than your typical water-based toner while acting almost like a serum. After using this toner, I often times feel that I don’t even need a moisturizer — that’s how hydrated my skin feels (I still do use a moisturizer and a serum though as I’m a totally hydration-obsessed). I also noticed that this product is perfect for situations when you need to apply makeup, but you don’t want to wash your face prior to doing so. I would use this toner as a cleansing solution for my skin. After a toner, I will re-apply a moisturizer and a serum and proceed with applying makeup. By using this technique I ensure that I’m hydrating my skin as opposed to stripping it from using too much water on my face. Check this technique out! I hope you like it too! Buy: $14.49 for 195 ml / 6.59 fl oz at FrudiaUSA.com and CVS.com. If you are like me and feel that there is no such thing as too much moisturizing, consider applying this hydrating serum before your Frudia moisturizer. It might sound shocking, but sometimes just a cream is not enough to allow all of the skincare benefits to absorb into the skin. The reason is that creams feature a slightly heavier formula that in addition to providing skincare benefits also “locks” all the ingredients in the skin. While serums feature smaller molecules that penetrate deeper into the skin and deliver all of the active ingredients deeper into the skin. In other words, it’s ideal to use both serum and a cream so you have all you ensure the delivery of all active ingredients deep into the skin while protecting your skin from “losing” them along the way. While some people prefer using serums only at night, I don’t mind layering products in my morning routine too. Luckily, this serum also features a super lightweight formula so you don’t need to worry that you will feel it on your skin. Usually, I will get just one spritz of the product into my hands, warm it up in my palms and apply it all over my face. Then, I will let it sit for a few moment and finish with the Frudia moisturizer. As mentioned before, at night I will repeat the exact same order with the only exception that I will add a few drops of oil for added nourishment. Buy: $21.99 for 50 g / 1.69 fl oz at FrudiaUSA.com and CVS.com. This gel moisturizer is my absolute favorite product from the line as it features the most lightweight and hydrating formula that I’ve tried in years. Usually, gel moisturizers leave a slightly sticky residue that I personally can’t stand — that’s why I rarely follow dermatologists’ recommendation for using gel products if you have acne-prone skin. To be honest, I was quite hesitant testing Frudia’s gel moisturizer too — but I ended up being so impressed with the product that I can’t imagine my skincare regimen without it! Imagine the most lightweight, almost whipped gel formula that momentarily absorbs into skin and leaves it bouncy and fresh-looking. The cream feels so thin and you barely feel it — which also ensures that this product is perfect for the days when you opt-in applying makeup too. If you are not a fan of foundations and concealers, I highly recommend this moisturizer too because it leaves your skin hydrated but not too shiny so you don’t even need to worry powdering your face after using this product. I already used up an entire jar of Frudia Blueberry Hydrating Moisturizer which says a lot as I’m a beauty blogger who has access to dozens of more expensive products but still pick this Korean beauty gem. While it’s totally fine using the cream only at night or only during the day, lately I apply it twice a day. I noticed that the formula of this product is compatible with many of the face oils that I love using at night so these days I just add a few drops of my oils into the Frudia moisturizer and apply this mixture overnight. In my humble opinion, this method works like a miracle! Buy: $19.99 for 55 g / 1.86 fl oz at FrudiaUSA.com and CVS.com. For the days when I want my skin to look extra glowing, I’ve been using these hydrating sheet masks by Frudia. While these deeply moisturizing masks are not available for sale yet, I highly recommend keeping an eye on them as they are great for dehydrated skin. It’s the middle of summer and many of us have been overdoing tanning so this mask comes handy when you feel that your skin need a deep hydrating treatment. 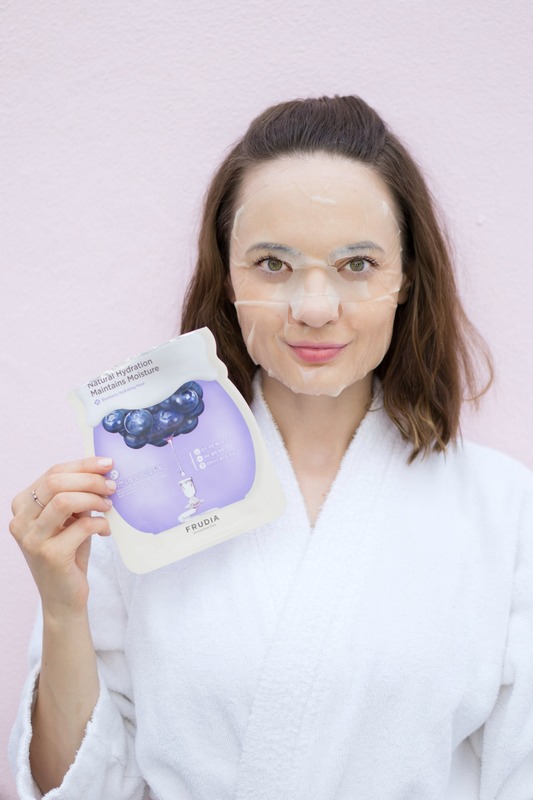 Similar to the rest of the Frudia’s Blueberry Hydrating Line, this mask is infused with blueberry extract which ensures deep hydration. It also features grapefruit seed oil which is perfect for improving skin tone and making your skin look more radiant. The mask smells so beautifully, feels so luxurious on your skin, and transforms your dehydrated skin in a matter of minutes — it’s hard to believe that this miracle product comes with such affordable price tag! What’s super unique about this mask is the application process. While the mask itself is your typical sheet mask, it actually comes with an additional layer which makes it easier to apply the mask. It seems like such a minor addition to the mask design, but it makes such a difference! You no longer need to look for the edge of the mask or figure out which way to apply it — the extra sheet makes it so much easier for you! Buy: $1.99 each at FrudiaUSA.com and CVS.com. 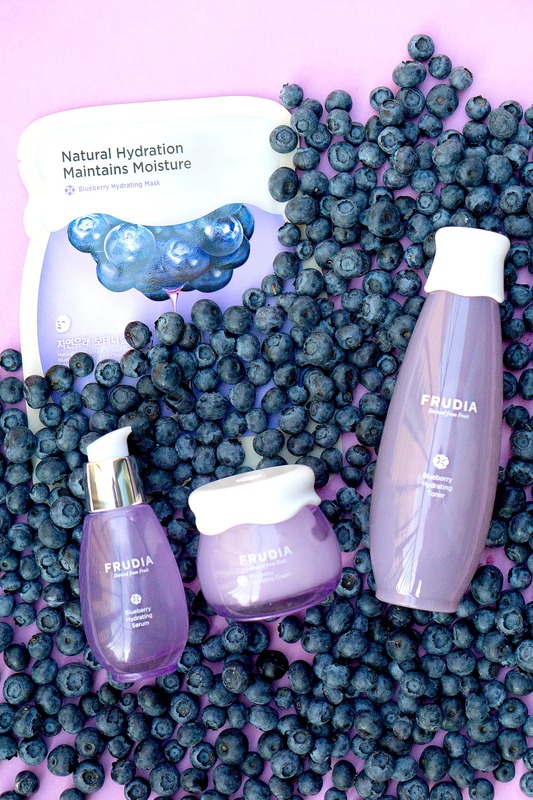 That was it for my review of the Frudia’s Blueberry Hydrating Line. I hope this post was helpful for you and you were able not only to learn about all the benefits of blueberries for your skin and health but also explore some of the best products for the dehydrated skin. Stay tuned as I report on other skin care lines by the brand and educate you on why fruits are so essential not only for your health but also for keeping your beauty. Meanwhile, I wonder what is your favorite fruit of all times? Do you use any fruit-infused skincare products on a regular basis? Please leave your thoughts in the comments area below!